The Basant Vihar Palace is located in Bikaner but has been turned into a heritage Hotel. This hotel is a wonderful example of architecture and the accommodation has also labeled as luxurious. 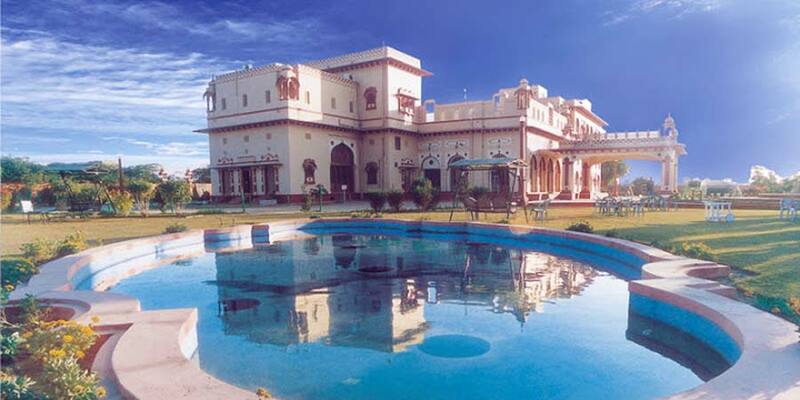 The hotel is end-to-end to Zanana bagh or better known as Royal Ladies Garden. The Palace has some breathtaking well-decorated gardens, colorful flowers and peaceful lily ponds envelop the entire hotel and offer a heavenly atmosphere. The Palace of Basant Vihar Palace was constructed by the order of His Highness Maharaja Ganga Singh, who was an expert personality with a royal sense of architecture and an artistic work.Now as the palace has been rolled over as a five-star hotel then the hotel serves with great facilities like laundry services, safety locker, money exchange, travel counter, doctor-on-call, ISD, Internet, fax and DG set. The dining section is awesome as it serves mouthwatering Mughlai, Chinese and Continental delicacies. As for Rajasthani cuisine, then it is the best place to have some of the state’s authentic cuisines. There are total of 31 rooms, of which 24 are Royal Deluxe rooms and 7 of them are Suites.Though it is completely refurbished from the inside, great care has been taken to preserve the original character of the rooms.